ALFA Romeo has a pedigree that ties racetrack and road, has motorsport titles and a garage that includes some of history's tastiest cars. And the roll call of road cars includes such stunning machines as the 33 Coupe Stradale, GT Junior, the 8C 2300 in the early 1930s and its stunning 8C Competizione reprise a few years ago, the GTs, Spiders and Giulia Sprint Speciale ... the list goes on. Of course there have been some horrors too, but I've learned not to call attention to Italian failures - they're quite passionate about cars and if you label one, say, ugly, you'll spend the next hour listening to a list of Italian cars that are beautiful. But the odd lapse in taste and other backroom dramas are to be expected when you consider Alfa Romeo celebrated its century in 2010. It's been around long enough to see a few ups and downs, but now under the huge Fiat Chrysler umbrella, there is a fresh sense of optimism. The little Mito and the svelte Giulietta do reasonably well around the world, but these two current range staples aren't the reason Alfaphiles are smiling. 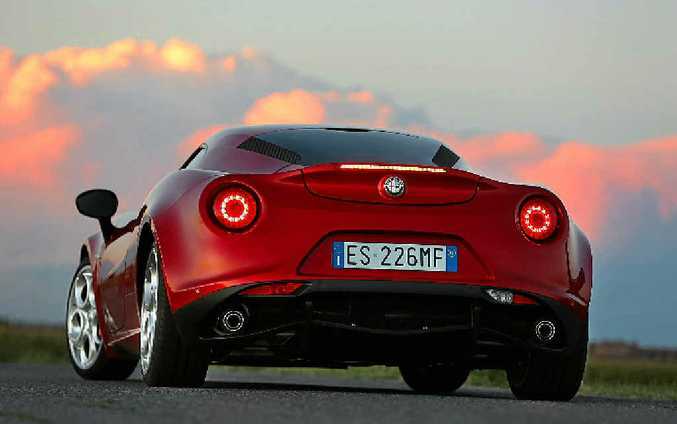 It's the 4C Coupe featured here - and after it was unveiled at a Geneva motor show, the 4C Spider is on its way. 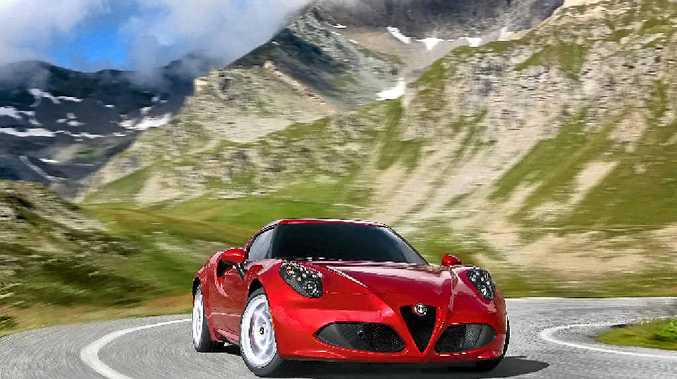 Conversation with designers and engineers about the first Alfa sportscar in years to really deserve the badge reveals huge amounts of pride and passion for the 4C. Its core is a pure driver's car that also happens to look incredibly good. The 4C isn't about creature comforts. The door handle is a leather strap, there's about enough luggage space for a lunchbox and while the light and functional seating is great from the good seat, the design doesn't exactly embrace passengers. Even the seat barely tolerates them and gives no quarter, no adjustments and importantly no recline. I'm about 1.82m and while about 50km in the passenger seat was okay, double that and it'd start getting a bit tiresome. Some of the lankier motoring journos at the launch in Balocco, Italy, said they found it quite hard to get comfortable. 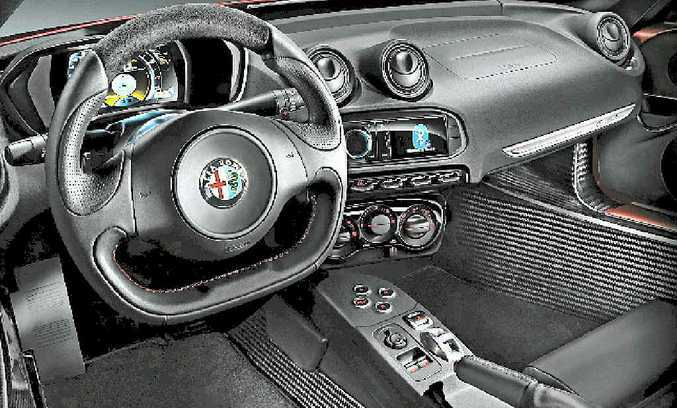 From the driver's seat it's a different story, and while the 4C does have a few issues, it's really going to take the fight to the likes of Lotus, which has a few of its own foibles and also stakes its name and reputation on being a maker of proper sportscars. It'll be a tight scrap. The 4C is built around a spectacular lightweight carbon tub, the Lotus around a lightweight "sandwiched" aluminium tub. The 4C sounds better; the Lotus has a slightly more direct steering feel. We rolled into the Fiat Chrysler test facility at Balocco and turned a corner to be faced with a line-up of red, grey and white 4Cs. They looked stunning, which Alfa designer Alessandro Maccolini put down to the abilities of the clay artisans in Turin. "You couldn't make this car look as good without clay models," he said. "The way the light works with the shape of the car and its curves can only really be seen with clay." It is inspired by the 1966 Scarabeo prototype and the exquisite 1967 33 Stradale (which was capable of 260kmh), and Maccolini talked about the car with obvious pride before taking a swing at the local opposition. "Lamborghini doesn't use clay - they're made with computers," he said dismissively. 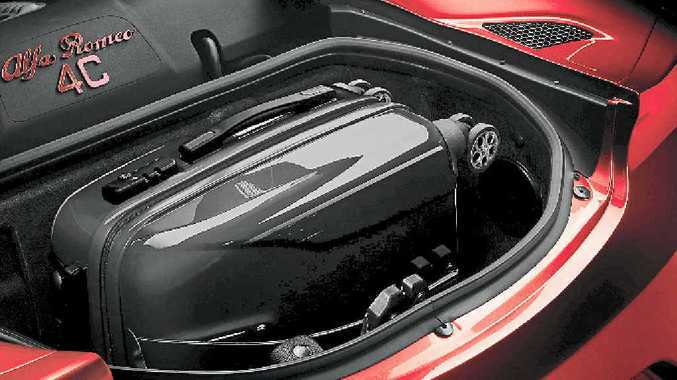 Every little tweak has been made to the car's aerodynamics, which are vital for cooling the 1750cc four-cylinder engine and controlling the car's feel at speed. It's got 40/60% rear weight distribution before you put the foot down, and when it's got a bit of pace on those numbers switch and help keep a positive and stable steering feel when you're having some fun. Although the car weighs only 895kg, so it's probably not the best choice in the tornado season, it felt confident on the road during the 200kmh region on the challenging "Alfa Track" section of the Balocco facility. It definitely felt light at those sort of speeds, but its roadholding and grip were such that you knew it wasn't going to let go. Two versions of the 4C Coupe will land in Australia - a standard and a special launch edition, which has a bit of extra fruit including larger wheels and a rorty sports exhaust system. It is quite loud, but if you're in the market for a pukka sportscar you'll appreciate it. At constant revs it's reminiscent of a superbike readying to do something a little bit naughty. Pricing and specification is yet to be confirmed but it's likely to be between $80,000 and $120,000, depending on spec and options. This certainly isn't the car for everyone. It is beautiful and impressively quick while still being frugal and environmentally responsible, but it's also loud, fairly hard riding and takes a bit of effort to handle. Some people like that. I did. The kids on bikes, other car drivers and truckies did too - including a member of the carabinieri who didn't speak enough English to even start discussing anything like tickets. I think he just pulled me over to get a closer look. In the land of supercar style, that's a good sign. Welcome back, Alfa Romeo.